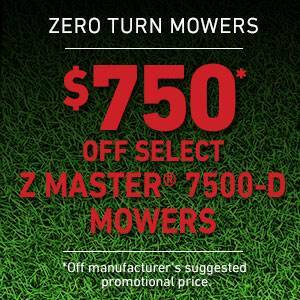 Toro Toro - $750 USD Off Select Z Master 7500-D Series Mowers Promotion Details | Available at TA Motorsports, Inc.
*$750 USD off suggested promo price on select Z Master 7500-D Series Mowers. Models 74060, 74064, 74072, 74074, 74096, 74028 and 74029. Valid on purchases made from March 29, 2019 through May 29, 2019. See participating retailers for details. To find a local retailer.